On 9th July, Hemalkasa Health Foundation UK, presented a very special screening of the blockbuster Marathi movie Sairat at prestigious Princess Anne Theatre at BAFTA . It was an honour for an Indian movie which became a first Indian movie to be screened at this renowned theatre. Sairat has been blockbuster and critically acclaimed across India for its strong social message. This event was organised to spread awareness of Dr. Prakash Amte’s Hemalkasa hospital and was a great success. The audience in BAFTA was enthralled with the award winning music of Sairat and could not stop themselves from dancing on the stage. This was perhaps the first ever movie screened at BAFTA that prompted an enthusiastic dance from the audience. It was four hours full of joy for audience but at the same time raised awareness and donations for the charity. 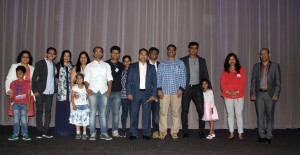 The movie show at BAFTA was organised by Siddharth Mukne with the support from Rahul Karurkar, Nikhil Deshpande who have been active members of the Hemalkasa charity for London.